Amma has said, “The Lord comes not once a year, but every moment. This Christmas Eve saw Amma, as in every moment, immersed in the spirit of giving … darshan. While She was doing so, some devotees began decorating a tree that lives in the garden in front of Amma’s house. When Amma finally came out of the temple it was night, and this tree had been transformed into a Christmas tree, lovingly draped in paper garlands, colourful Christmas lights and crowned with a star. Towards the end of darshan, a lady devotee came to Amma and complained that her sandals had been ?tolen’ from in front of the temple . Amma then sent a brahmachari to find a plastic bag. 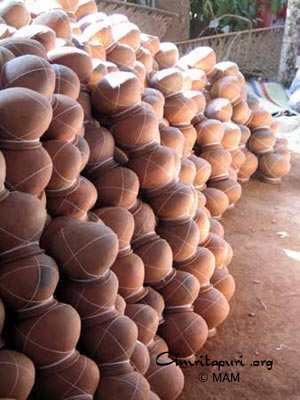 When it was brought, Amma tried to fit a pair of sandals into the bag, but the bag was too small, and She made the brahmachari go find a larger bag. He returned with a new bag, and this time the sandals fit perfectly. Amma then said that from now on, plastic bags should be given for devotees to put their footwear in, which they can then keep with them in their shoulder bags, thereby improving the situation in three ways; it will prevent them from being stolen or misplaced; there will no longer be any need for two people to guard the shoe-rack, saving that much man-power for other work; and finally there will no longer be any need for a shoe-rack at all, saving that much space for something more important! 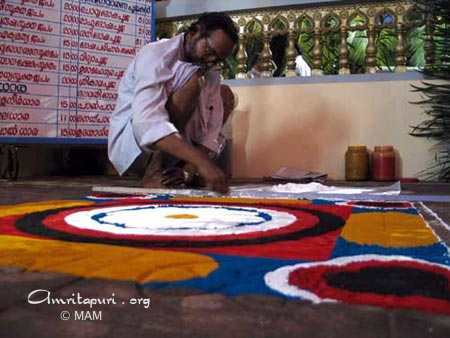 India has always welcomed other faiths, and Kerala in particular is said to have been home to some of the earliest Christians, and preserves India’s largest Christian population to this day. Christmas is always an extra special day for both western and Indian Christians to receive darshan from Amma. Many consider Amma to be an embodiment of the same divinity that was born as Jesus Christ. Amma’s children offered a Christmas performance while Amma gave darshan. There was a lively electronic keyboard performance, adding to the jovial atmosphere; an operatic serenade by one of the ashram residents, who is a professionally trained opera singer; and dances by both western and Indian children. Children from one of Amma’s orphanages presented traditional Indian dances in full costume, their innocence endearing themselves to one and all. Later, some of Amma’s western children also offered a simple and elegant dance. All of the performances received a hearty applause by Amma Herself, who would pause the darshan line just long enough to clap and smile with approval and happiness. In Amma’s Amritapuri ashram, all religions and their essential teachings are respected and supported. Amma truly honours all spiritual traditions in the most direct and meaningful way ” by encouraging the followers each to go deeper into their own faith, and become embodiments of the universal divine qualities that all religions hold sacred. Love, compassion, peace, wisdom, selflessness – these qualities all lie within us, and are in fact our true nature. And, as embodiments of this Truth, we are One. It was after midnight on the morning of 21 December as seven busloads of Amma’s weary children returned to Amritapuri from the Kozhikode tour. One of the first things to greet everyone as they entered the ashram’s back gate was a humble manger scene near the western canteen. The sight offered our tired bodies fresh spirit. 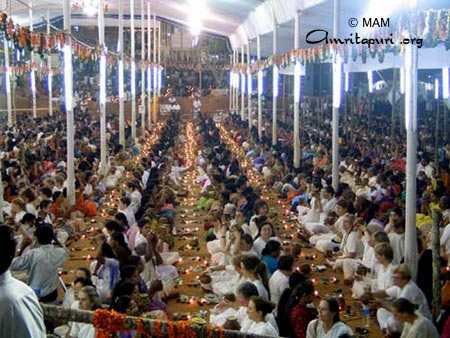 From one celebration to another, life with Amma is a never-ending festival! During this week’s question and answer satsang, Amma asked Her western children to explain the true significance behind Christmas celebrations. Many beautiful responses came pouring forth. One devotee expressed that she felt that the true essence of Christmas has been lost these days, saying that too much importance is given to external things like spending money on food, clothes and decorations. “The real essence of Christmas this devotee continued, “has to do with a child born 2,000 years ago named Jesus, who became the Christ, and who took a body like the rest of us except that, like Amma, He was born knowing who He was: the all-knowing and universal Divine Energy. Like a good shepherd, He came looking for all of His lost sheep, and just like Amma, He came to wake us up to the awareness of our true Nature! The teachings of Jesus can guide us from unreality to reality. He was the same divine energy that has now incarnated as Amma. One western man came forward and told a story from his childhood. “Once, when I was a boy he said, “I bought a small ceramic choirboy as a Christmas gift for my mother. However as I was returning home, I stopped to join a snowball fight with some other boys. As I put my bag down, the choirboy was shattered. When I got home and realized this, I cried and cried. But my father very patiently helped me to glue the pieces back together and apply fresh paint. When I gave it to my mother, she was so happy! And he added, “I just received an email from my mother telling me that she had just put the same choirboy onto the mantle. So, Christmas always makes me think of this choirboy.He then began to express how grateful he is to Amma, but became so emotional that he couldn’t continue speaking. Amma replied that She liked all the answers that Her western children gave, and that this devotee’s story of the choirboy was a good one, showing that what he was really trying to give to his mother was his heart. Amma recollected the words of Jesus, “Love thy neighbour as thyself, and explained that only when you see others as your own true self will real love flow towards the whole of Creation. Elaborating, Amma said, “All are joined by the thread of love. Love knows no barriers, such as caste, creed, religion or nation. We are all like different beads joined by the thread of love. Love has no boundaries. Love is the essence of all religions. The awareness level is very low in all of us at present, and festivals like Christmas must help us to regain this awareness. Such occasions have to be used to rekindle love within us. “Awareness is needed for this. We have to wake up. To realize one’s true nature, the Divine within us, we have to transcend the ego, and this comes through surrender towards God. As you become more and more humble, you become more and more receptive to God’s grace. The attitude that ‘I am just a mere instruments in God’s hands’, that it is God’s strength and not my own that does everything, should always be maintained. Like a mini-Amritavarsham50, the crowds, as many anticipated, were indeed the biggest today, turning out in full force for Amma’s final Kozhikode darshan programme. 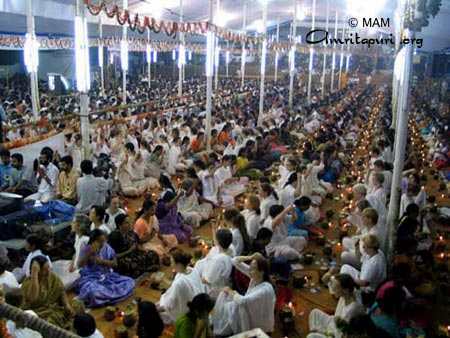 Over 12,000 men’s darshan tokens were distributed for the evening programme alone, and over 18,000 were given for the women, with lines winding all the way out onto the road beyond then ashram gates. Amma will hug over 30,000 people before finally standing to leave, which by the looks of it will undoubtedly be well into late tomorrow morning, if not afternoon. The ashram grounds are a teeming sea. Walking from the darshan hall to the dining hall is an arduous pilgrimage! The local devotees doing seva, distinguishable by the badges on their chests, have their hands full, and their dedication and effort is admirable. Many have come for the special Sani (Saturn) Puja, which Amma personally led this evening. The 108 names were chanted while, sitting before oil lamps, everyone performed the puja . In Vedic astrology, Sani is considered a malefic planet that can trigger difficulties for those who fall under his influence. This mass puja is performed in order to create positive vibrations that will offset any negative influence that may have accrued due to Sani’s harsh gaze. Amma has said that a spiritual aspirant who has surrendered to a Satguru need not worry any longer about planetary effects. But, She has also qualified this by saying that it doesn’t hurt if you have some forewarning of a change in the weather, so you can take the necessary precautions. If you know it’s going to rain, you have the chance to grab an umbrella. In the same way, these pujas serve as a general umbrella that can mitigate harmful planetary effects. With tens of thousands here today, the collective positive mental current is sure to have its effect. Amma has given the following example to illustrate this. If one has only a single 10-watt bulb, it may be difficult to read by, but if one brings in thousands of 10-watt bulbs, reading won’t be any trouble at all. 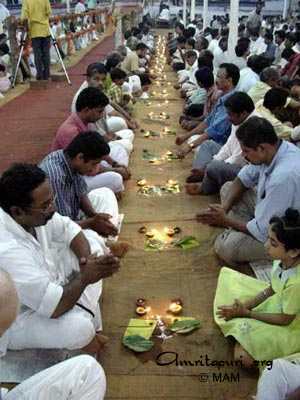 Like this, mass pujas can have wider and more powerful effects than individual rituals. The crowd sat absorbed as Amma guided them through the puja’s steps, and as the 108 Names of Shani were chanted, everyone responded with “Om Shivashaktyaikya-rupinyai Namah”. The darshan hall twinkled with what seemed a million little stars, as each of the over 5,000 within its perimeter waved their arati flame. The puja ended as everyone stood and turned clockwise in place, again chanting the sacred mantra. This represents the circumambulation of our own heart, the seat of the Self “the Atman” which is identical to God, the Absolute Brahman, and to which all worship is truly offered, though the forms may vary. Through this simple but sacred observance, Amma has brought the highest wisdom down to the most understandable form, which even a child can understand… which is a good thing, considering we’re all children in the presence of Amma. Like a river, receiving all, whether they come to drink or bathe, or even walk past, ignoring Her grace “Amma simply flows. Kozhikode stands as yet another testament to this, as Amma flows into the hearts of the local devotees tonight, one last eternal time … until next year. It’s 8:15 am. The sun is well into the sky and Amma has hugged well over 30,000 people in the last 12 hours. Amma has just stepped through the foyer curtain outside of Her room. Children are already there, waiting to offer their final pranams before Amma leaves their midst. It will be some time yet before Amma has hugged Her last Kozhikode child, and heads back to Amritapuri. 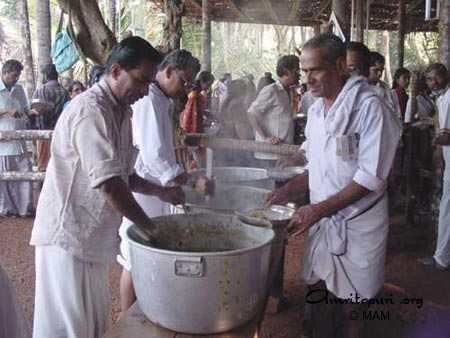 Meanwhile, Amma’s ashram children finish washing the cooking pots and dismantling the various stalls and service areas. Supplies have to be inventoried and buses reloaded. Sleep has to wait for the 10-hour road trip ahead. These opportunities to serve are no doubt trying, and require a real spirit of renunciation … however, no one complains. No one even feels like complaining! How does one explain to others how serving the Guru is such an inexpressible joy and blessing? One must simply grow into such an understanding; it cannot be conveyed through words. Amma has shown through Her own example how real selflessness overrides any sense of strain or exhaustion, and actually fills one with boundless energy “the energy of Divine Love. Which is why Amma’s smile is ever present, and Her arms ever reaching out to us, Her beloved children. Amma is the very love She radiates. 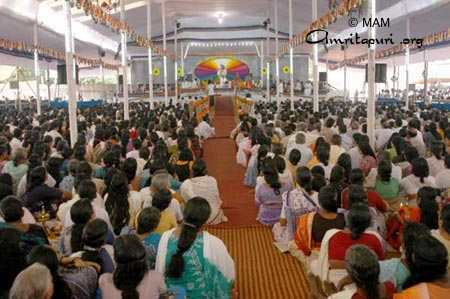 Over the past three days the atmosphere at the Kozhikode ashram has become as if super-charged. The five daily archanas, the special pujas in the brahmasthanam temple and the general devotional enthusiasm of the crowds has generated a palpable spiritual energy. This day saw the biggest crowd so far for this program. New shelter had to be erected adjacent to the already huge darshan hall, which was specially constructed for the programmes. 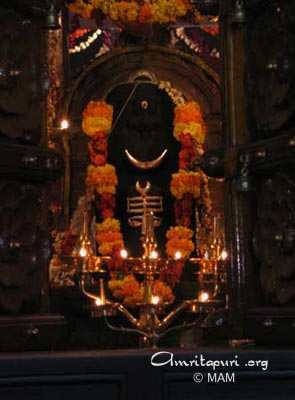 It’s expected that tomorrow, the final darshan programme, will see even larger crowds. I’ve been seeing Amma for over 20 years. The first time was in a house here in Kozhikode. I didn’t have any special experience the first time, but I had a deep desire to keep seeing Amma as much as possible. I simply want to serve Amma. I receive medication through Amma’s ashram, and so I also want to give something to Amma. 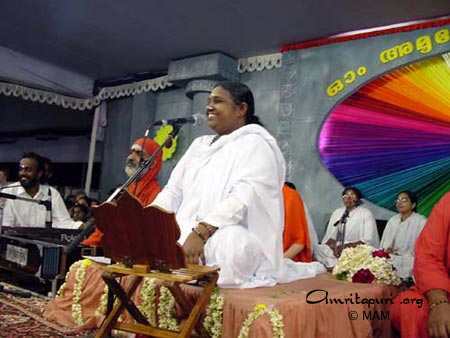 I met Amma 11 years ago, at the first Kozhikode Brahmasthanam Festival. After that first darshan I had many dreams of Amma that always made me long to see Her more. 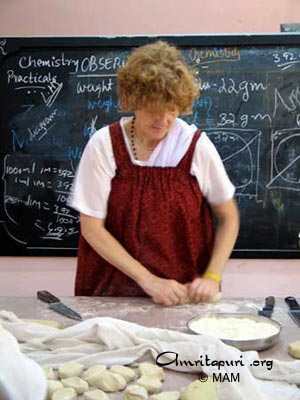 I’m serving because it’s Amma’s upadesh (teaching). I’m willing to serve in any way. 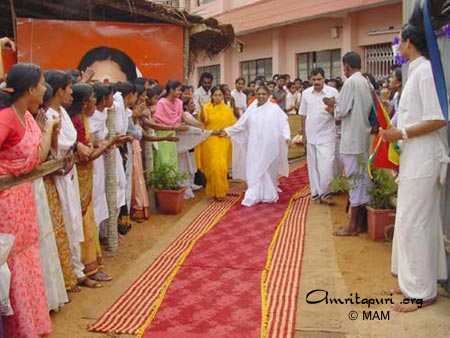 We come and serve because Amma Herself comes to us in Kozhikode. It’s a supernatural power Amma has. Amma has the power to heal everything. Amma was born to heal everything, to solve all the world’s problems. So we come to see Amma. With Amma, there is no difference between India and America or Europe, or any other country. Amma is the same everywhere. We’re all Her children; we’re all one. I met Amma in 1999, in Vallickavu. My sister, who lives here in Kozhikode, was a devotee, and she began telling me about Amma’s boundless love and compassion. So I went to see Her, and have been going to see Her regularly ever since. I received mantra from Amma that first day, without even asking for one. Amma just gave it to me. After that I stopped all my bad habits, like coffee and tea. 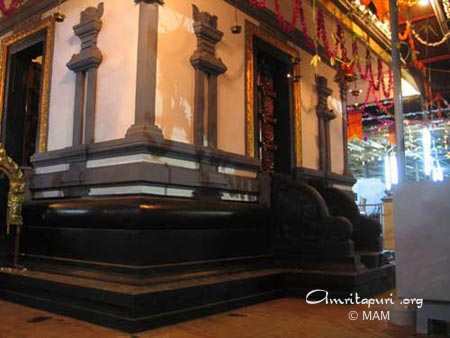 Before meeting Amma, I only had then concept of visiting temples. But, after seeing Amma the first time, I realised that Amma was the real God. I had so many sorrows, but Amma healed them all. Once while having darshan, I told Amma that I have been suffering from a heart illness. Amma told me to go at once to AIMS for a check up. The doctors there found that my condition had become very bad, and recommended immediate heart surgery. Now I have a pacemaker in my chest. Amma saved my life.When I saw Amma next, She asked me how my health was. I told Her that I was better, and that I wanted to do seva at AIMS. Amma told me to work in the juice stall. Amma is everything Guru, Mother, Devi. She’s the Universal Mother. In the future I want to live in Amritapuri. Amrita Vidyalayam students Reshma, age 15; Kavya, 16; Nandini, 16; Labeeba, 16; and Sowparnika, 16, also shared their experiences. Sowparnika: Today was my first darshan, just a few minutes ago. Before meeting Amma, I didn’t really believe in all these things, but after Amma’s darshan, I feel different. Something changed inside me. I feel very happy! Nandini: I first met Amma when I was in the 6 th standard, but it wasn’t until my 8 th std. that I really began to feel Amma’s greatness. Once we (the students) went to Vallickavu. It was a Devi Bhava day, but we had to leave early. Reshma: We told Amma that we were sad to not get to stay for Amma’s Bhava darshan, and Amma said that She too was sad that we were leaving. So, Amma grabbed a handful of chocolate kisses and gave them to us! 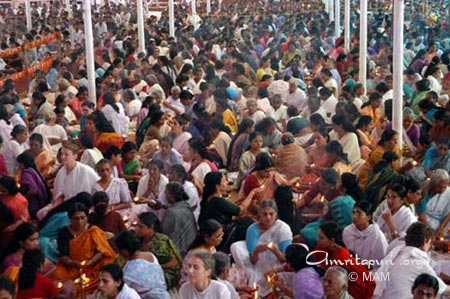 But then during Amritavarsham50 , we all got to sit near Amma. So we were happy! Kavya: We like going to Amma’s Amrita Vidyalayam. It’s not like other schools. Not just the education, but also the culture and the atmosphere, the faculty and the students – it’s all much better. Labeeba: We’re so lucky to have so much contact with Amma. Displaying such tireless dedication to Her children, Amma has won the hearts of millions, and inspired them to cultivate a dedication to selfless service in their own lives. How can this but bring a significant transformation to the world? 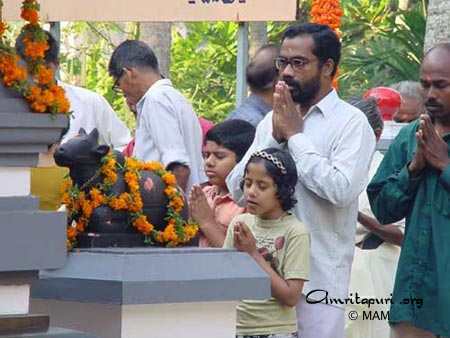 Many of the devotees in Kozhikode are very simple people. Rural villagers and tribal people come for Amma’s darshan, saving what little money they have just to travel here. Kozhikode is yet another example of how Amma is touching the lowest substratum of society with Her infinite compassion and all-embracing Love, raising them up, reminding them of their inherent dignity and worth. In so doing, Amma is revitalizing India from its very foundation, since the poorest of any country tend also to be that country’s backbone, performing all of the laborious jobs that others can afford to pay them to do. With Her inspiring and practical satsangs on spiritual truths and practices, and through Her elevating and otherworldly bhajans, Amma is teaching the highest spiritual wisdom to everyone, regardless of education or economic status, in the simplest and most effective manner ” through Her flawless and enchanting example. 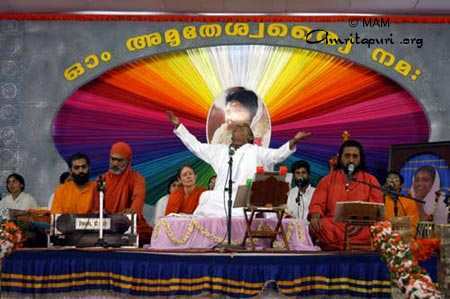 This is not to say that all of the devotees in Kozhikode are underprivileged. As always, one finds a mixture: average middle-class families, students and young professionals, as well as the wealthy and VIP’s such as high government officials or prominent businesspeople. All come for Amma’s blessings. As a consequence, Amma is reaching all points along the social spectrum, and the goodwill of those devotees with more material means insures that through time and the growth of compassion and generosity, a true social equilibrium can be met. The seeds of love and dharma that Amma is planting in everyone’s hearts will eventually flower and restore true balance to society. Thus, at all of Amma’s darshan programmes one finds the wealthiest waiting shoulder to shoulder in line with the poorest. 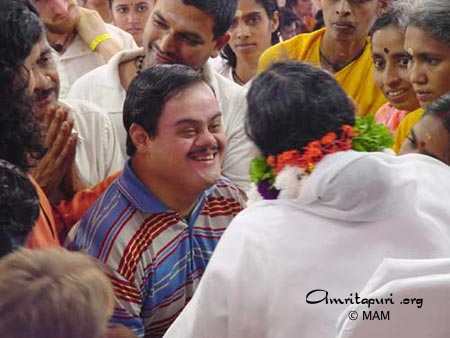 All are equal in Amma’s eyes, and the shared expression of love and longing on everyone’s faces for their cherished turn in Amma’s arms even makes Amma’s children resemble one another in a certain subtle way … just like true brothers and sisters. Witnessing all of this, one cannot but be humbled both by Amma’s dedication to the spiritual growth of Her children everywhere and all walks of life, and in turn by Her children’s simple faith and willingness to grow. It’s further proof that to mature spiritually, one doesn’t necessarily need to become well versed in high philosophy or engage in rigorous austerities. One need only expand the heart and love with a selfless innocence. When this is done, all true spiritual wealth is showered upon the devotee. As Amma Herself has instructed, “Purify your heart. See God in all things and love all beings. You don’t have to do anything else; you will be given everything you need. 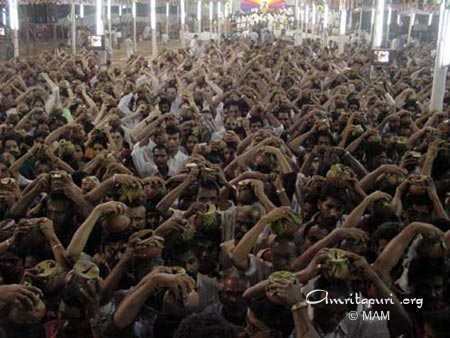 Whatever their material standing, the blessed devotees of Kozhikode are spiritually among the richest. A lone butterfly danced happily on Her garland as Amma stood gazing at Her children in all Her divine magnificence. Thus the first Devi Bhava in Amritapuri since early September came to a close this morning at 11:30 am. Yesterday morning Amma began giving darshan at 9:45 am, and stayed until 2:15 pm. With only a couple of hours break, Amma was back on stage again by 4:45 yesterday evening for Devi Bhava, and, as over 18,000 darshan tokens had been distributed, didn’t return to Her room until today, a quarter after noon – a total of 25 hours of service to Her children in a 24 hour day! 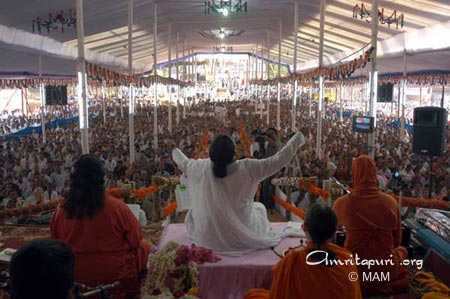 As usual, most ashram residents had stayed up all night with Amma. Most anticipated a day of rest and recuperation before making the 10-hour road trip on Tuesday to Kozhikode, where Amma will conduct four days of public darshan programs. However, life with Amma is everything but predictable, and in this case the anticipation most had for a leisurely day off was to be traded for a chance to practice some renunciation. Shortly after lunch (or breakfast, depending on how you view it), word started making its way through the ashram grapevine that the buses might be leaving that very night (Monday) itself! By 3 pm it was official. Many ran to quickly do laundry in order to catch the last drying rays of the sun, and others got what little sleep they could before we packed up and set out. Just after midnight, when the seven large tour buses had finally been fully loaded with people, luggage and supplies, the ashram caravan headed north. Five hours later we stopped in Kodungalloor to rest at one of Amma’s Amrita Vidyalayam schools. Although the sun arose just after everyone had finished unloading the buses and laid down for sleep, by 9 am almost all were up again, preparing for the next leg of the journey. After a late breakfast we reloaded the buses, and after a light early lunch were on the road again. It’s truly amazing how vigorous one manages to remain when in the service of Amma, even with little rest and erratic food and sleep schedules. Despite the difficulties, all one sees are smiles. It’s been a year since the devotees of Kozhikode (Calicut) received the blessing of Amma’s darshan, and many couldn’t wait until the first public program tomorrow. Amma arrived at the Kozhikode ashram at 6:43 pm, and so many of Her children were waiting for Her that it almost felt like a program was already in full swing! Amma responds to their guileless hearts by showering them with an especially radiant affection, and there is a profound lesson here for those with eyes to see. Amma’s way of reflecting Her children’s hearts reminds one of Sri Krishna’s words in the Bhagavad Gita, “As My devotees approach Me, so do I receive them.”… and so does Amma receive us. The first day’s program in Kozhikode began at 5:15 am with one of the five archanas that are to take place each day, as part of the brahmasthanam festival that is happening in tandem with the public darshan programs. Amma installed a brahmasthanam temple on the ashram grounds 11 years ago, which is maintained by the ashram priests who conduct pujas throughout the year. Amma’s annual visit marks the commemoration of this temple’s installation, and special planetary pujas are performed for the masses, primarily to Saturn, Mars and Rahu. Amma came out for the morning program at 11:00 am to lead bhajans, followed by archana, satsang and then darshan. 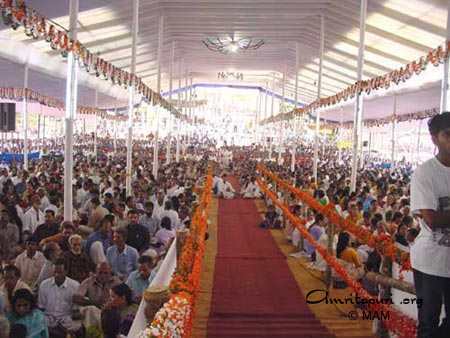 The darshan hall, constructed specially for the program, was filled to overflowing, as was expected. The morning program didn’t end until about 5 pm. Amma returned again for bhajans, satsang and darshan by 7:30, and gave darshan until 4:30 am … 15 hours total darshan time – a slow day, by Amma’s standards. … but it was still just the first day. A large crowd gathered in front of the temple this morning, as Amma welcomed Her newest resident into Amritapuri. New ashram residents don’t usually cause such a stir, but this is a special case. Her name is Lakshmi – the elephant. It was just after 11 a.m. and everyone was on or around the temple steps, looking up with anticipation, waiting for Amma to appear. Suddenly, to everyone’s surprise, Amma emerged from around the corner below! Amma stood at the base of the steps, as Lakshmi, garlanded with yellow and orange flowers and anointed with sacred ash, was brought forward to receive Amma’s blessings. Amma fed Lakshmi apples, bananas, payasam, and balls of jaggery and nuts with affection, speaking softly to her while stroking her brow and trunk. Lakshmi was perfectly calm and composed, happily accepting the sweets from Amma’s sweet hands. Amma teased her, “Lakshmi, have you seen Ram yet?” eliciting laughs from those nearby. Ram is the five-year-old “brahmachari” elephant that has lived in Amritapuri for the last three and a half years. Now Lakshmi becomes his elder sister. After whispering a few loving words, and hugging and planting some tender Motherly kisses on Lakshmi’s forehead, Amma turned and walked up the temple steps, returning to Her room. Lakshmi was then led to her new home, near her new brother Ram’s stable. So many people offer gifts to Amma. Why do you offer Her elephants? Why Lakshmi? Was there anything special about her that made you choose her? With the nightly interplay between Amma and Ram already such a source of fun and laughter, the addition of a female elephant is sure to provide even more delight, for Amma, Her children, and of course Ram, who now has a friend to play with and share his heart with. 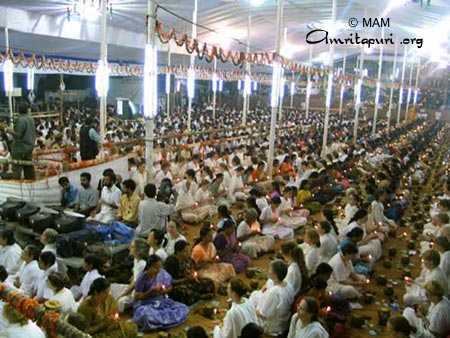 As bhajans ended this evening and Amma left the stage, there was a race of eager devotees to Amma’s house. Amma almost always feeds Ram at the base of Her steps after bhajans, and with this morning’s arrival of Lakshmi, tonight’s elephant feeding promised to be a double feature. Ram was brought in first to the cordoned patio area to receive his prasad from Amma. As usual he put on a show, periodically bowing to Amma, playing tug-of-war with the brahmacharis, trumpeting aloud and spraying devotees with water. Ram has grown to love the limelight! But, we all must to learn how to share. Ram was soon led out, and his new sister Lakshmi brought in. She too received prasad from Amma, and just as during her morning introduction, she was as calm and composed as ever – a true lady! Amma again playfully asked her if she had seen Ram yet, and showered her with affection. After Lakshmi enjoyed Amma all to herself for some time, Ram was brought back in, to share the bounty of Amma’s love (and sweets!). Together they stood before Amma, trunks reaching and waving, mouths open in what seems quite like a smile, and appearing perfectly comfortable with one another. Amma had fun feeding Ram, then Lakshmi, and Ram again, and then Lakshmi again, back and forth, trying to keep up with her two greedy young elephant children. — right, left, right, left — just like She was giving darshan. Lakshmi was eating faster than Ram, and when Ram would become a bit too insistent, Amma, smiling out of the corner of Her eye, would pay closer attention to Lakshmi just to make Ram jealous! At one point, this elicited a loud, trumpeted objection from Ram, to which Lakshmi responded with a louder roar, bringing a surprised and amused expression to Amma’s face and delighting the crowd! Amma said to Ram,now you can tell all your stories to Lakshmi. And Lakshmi can do the same with you.Then Amma told Ram to give his hand to Lakshmi, at which point he met her trunk with his and they intertwined, sharing a curious and friendly sniff. Then, in a display of obvious affection, Ram and Lakshmi gently touched their foreheads together, and lingered for a moment that way. Amma was clapping happily. A little later, Ram went in search of sweets, sneaking his trunk into Lakshmi’s mouth. Lakshmi returned the favour, and for a moment the two were one. It was a morning abuzz with activity in Amritapuri. Actually, the entire week was busy, but this morning especially. Duties ranged from sweeping the sand to cleaning Amma’s house from top to bottom. The construction of a new water treatment system was finished just the night before and various last minute touches were being made here and there throughout the ashram, generally beautifying the grounds all to make it worthy of receiving our most Beautiful Amma. For almost two months Amma’s ashram residents have been relying on brief email updates about Amma from those fortunate enough to be on tour with Her, but today we have our own update to share: Amma has come home! It’s true that Amma claims no home other than our heart, yet there is something very poignant about Amma’s Amritapuri homecomings. The atmosphere was drenched in a quiet devotional fervour, and there is a sweet longing in everyone’s eyes, whose indrawn expressions indicate private inner communion. Many ashramites working in the branch ashrams throughout India to offer their pranams to Amma, making it a divine family reunion. Though meditative, spirits are high it’s a festival day! At about a quarter to noon, the ashram bell rang out thrice, and our souls collectively resounded – Amma had arrived. There was a general flurry as thousands scurried for a good spot to catch sight of Her. Amma’s camper van turned onto the ashram grounds, and stopped near Ram the elephant’s stable first. Playfully tugging the shirt collar of the brahmachari that was driving, Amma sat Herself down in the driver’s seat so She could feed Ram through the window. With laughter, everyone delighted in the familiar but ever-fresh interplay between the young elephant and the Mother he clearly adores. Amma then went back into the camper and opened the side door. As the camper made its way through the ashram grounds, Amma stood in its doorway with Her hand outstretched to touch those She passed. he time was exactly 11:51:48 a.m. when Amma’s camper finally stopped in front of Her house. Though midday, it was dawn in the hearts of Amma’s ashram children gathered around to receive Her, and the sunshine pouring out camper door seemed to rival that in the sky. Our minds reflected its divine light like many moons. The sea of bodies parted as Amma made Her way towards Her stairway, pausing here and there to share a few words, a smile, a glance. Pada puja was performed, the arati flame was waved and garlands were offered, all with a deep reverence. Amma then moved slowly up the stairway, walking backward so that with an unbroken gaze She could, shower Her children with Her inconceivable affection. Eyes glistened with tears and the occasional yearning cry of Amma! was heard. Finally, as Amma reached the top of the stairs, the occasional cry of Amma became a chorus, as Amma raised Her folded hands in a salutation that was returned by all, and brought them Her heart, offering it to us. Is there any gift greater than this?